The Large Tube Box (Anaconda Case) has been designed for a international Aerospace OEM for use on their site in Germany. The role of the Large Tube Box (Anaconda Case) is to eliminate all cardboard packaging before parts are sent to the build line. Acting as a reusable solution for kitting engine components. This solution is a development of our large tube box which has proven successful at the companies midlands based facility. 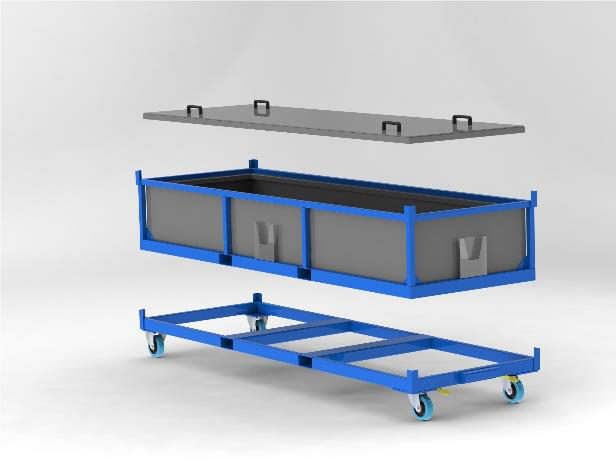 The modifications to the design include a wheeled dolly and separate storage container. 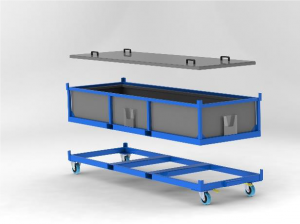 The storage container features an additional mild steel framework and fork pockets to allow multiple containers to be stored in racking when not in use. In addition, an upgraded braking mechanism has been included as well as a location to store the lid on the side of the unit. The main box is manufactured from 6mm thick PE300 sheet reinforced with PE300 box section. It features a hinged lid fastened with toggle latches. The interior has an egg box foam base while the sides are covered in 5mm self-adhesive foam to reduce the risk of damage to the parts being stored. 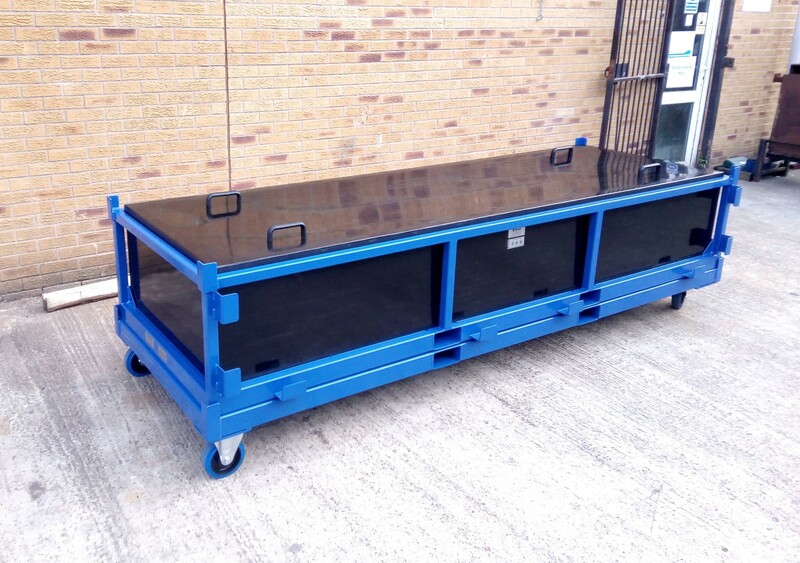 The box is fixed to a mild steel base frame designed to allow fork lift truck access for manoeuvring. The base frame also gives the whole assembly added strength. The base frame has been powder coat finished in blue 20-D-45. While a black PE 300 has been used for the box assembly. Approximate overall size – 3150mm (L) x 1044mm (W) x 800mm (H).